Did you ever bake without sugar? I just tried and was amazed, as nobody noticed that this beautiful cake was sugar-free until I told them! It was still sweet as I used dates in the dough. The cream was a bit tangy for the kids, so I added some rice syrup for them. You can make this beautiful cake in no time and with very little effort! Let me tell you how. 1. Preheat the oven at 140 degrees. 2. Place some wet and squeezed baking paper in a 20×25 cm baking tin. 3. Take out the pit from the dates (100g) and then chop them. 4. Whisk the room temperature butter (125g), flour (225g), baking powder (16g), vanilla extract (1tbs), 2 eggs, milk (125ml) and chopped dates (100g) together to form a creamy dough. 5. Pour it in your baking form. 6. Bake for 40 minutes or until golden brown. 7. Let it cool down (out of the form if possible). 8. Bring your juice (50ml) to a boil in a small pan. 9. Add half of the raspberries (100g) and turn off the heat. 10. Whisk the quark (250g) until creamy, this will take a while. If you are using mascarpone, no need to whisk it. If you are using ricotta, you may want to be a bit careful, as well as with other cheeses. The goal is to make a cream that you can then spread easily on the cake. 11. Add the remaining 100g of raspberries to your cheese cream and mix well, it’s ok to destroy the berries in the process, they will make the cream moist. If the cream is too tangy, you may add some rice syrup or ahorn-syrup to it. 12. 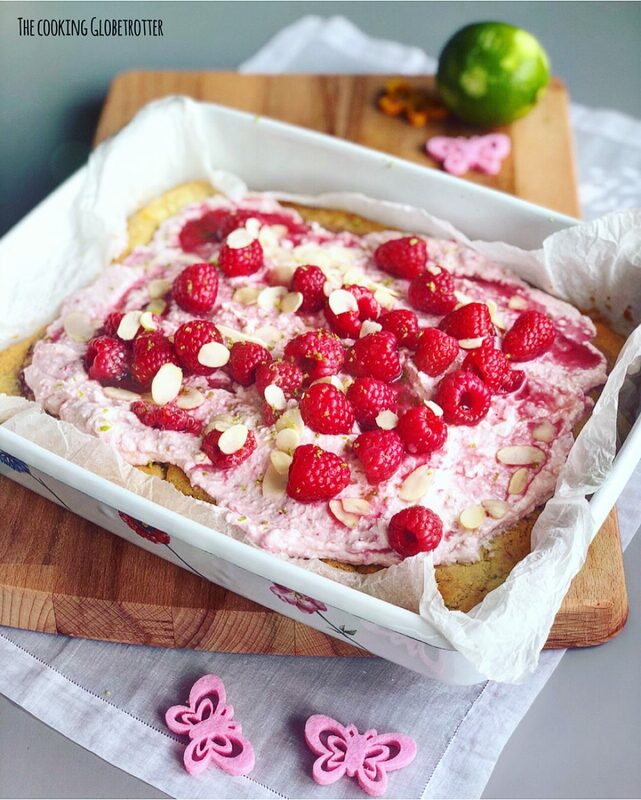 Once the cake has cooled down, pour the cheese-raspberry cream over it and spread it out nicely. 13. Pour now the raspberry juice mixture over the cream. 14. Grate some lime zest directly over the cake. 15. Decorate with the sliced almonds. 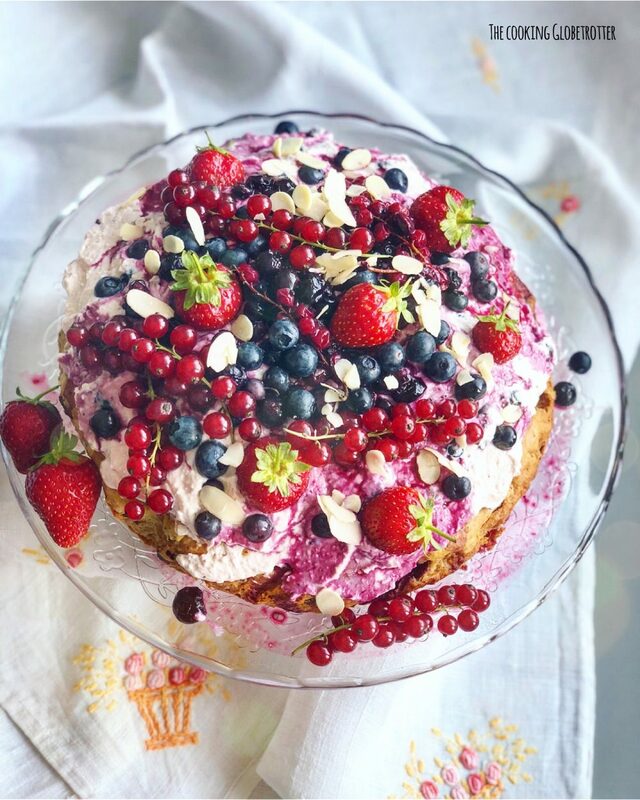 Try to make the cake with other berries or fruit! I used dates and rice syrup rice syrup from Reishunger. Was really impressed with the quality of the dates. If you use my code “reislaura10” you can get the Reishunger products with 10% discount (affiliate link). Here is the recipe to print out! Place some wet and squeezed baking paper in a 20x25 cm baking tin. Take out the pit from the dates (100g) and then chop them. Whisk the room temperature butter (125g), flour (225g), baking powder (16g), vanilla extract (1tbs), 2 eggs, milk (125ml) and chopped dates (100g) together to form a creamy dough. Pour it in your baking form. Let it cool down (out of the form if possible). Bring your juice (50ml) to a boil in a small pan. Add half of the raspberries (100g) and turn off the heat. Whisk the quark (250g) until creamy, this will take a while. If you are using mascarpone, no need to whisk it. If you are using ricotta, you may want to be a bit careful, as well as with other cheeses. The goal is to make a cream that you can then spread easily on the cake. Add the remaining 100g of raspberries to your cheese cream and mix well, it's ok to destroy the berries in the process, they will make the cream moist. If the cream is too tangy, you may add some rice syrup or ahorn-syrup to it. Once the cake has cooled down, pour the cheese-raspberry cream over it and spread it out nicely. Pour now the raspberry juice mixture over the cream. Grate some lime zest directly over the cake. Decorate with the sliced almonds. This recipe has been featured in the Expat Living Singapore February 2019 Issue, Page 111.